The outside of the house and grounds were beautiful as well as the common areas. I was a bit disappointed with the rooms that felt more like a dated hotel. The staff was accommodating and professional. Renata, who runs or manages patrons at the restaurant, was excellent. She accommodated us even though it was late, did not have reservations, and had a full tour that she was managing. When our order was delayed, she also treated us to a starter as compensation. The morning breakfast was likewise well managed. Location was great. Very close to the Enniskerry village and Powerscourt Estate and gardens. The green surroundings and property away from the hustle bustle was the highlight. The family room we rented was nice and large and had two bathrooms which was a bonus! The Summerhill House is tucked away in the most lovely Irish setting one could ask for. We spent the night there just to get away from the big city. We had a lovely dinner and the bartender Joshua was really great! Our room was very large, well appointed, and super clean!! Our next visit will probably be for 2 or more nights! The Summerhill House is a hidden treasure that everyone needs to discover!! Summerhill House Hotel This rating is a reflection of how the property compares to the industry standard when it comes to price, facilities and services available. It's based on a self-evaluation by the property. Use this rating to help choose your stay! Rooms at Summerhill House Hotel feature a private bathroom with free toiletries and a hairdryer. Guests can relax in the room with a TV and free tea and coffee, including a herbal tea selection. Most rooms also offer scenic views of Bray Head. The Restaurant at Summerhill House serves seasonal, locally sourced cuisine, along with traditional Sunday lunches. The Cooper Beach Bar features an open fire, serving a wide range of drinks in cozy, relaxing surroundings. The Rainforest Day Spa is located next to the hotel and offers a range of spa packages. The spa overlooks the Irish Sea and the hills, with loungers surrounding the spa’s hot tub. There is a sauna and a range of luxurious holistic and beauty treatments including Swedish massages. Free parking is available, and Enniskerry village center is just a 10-minute walk from the hotel. The hotel can arrange guided walks through the beautiful hills of County Wicklow. 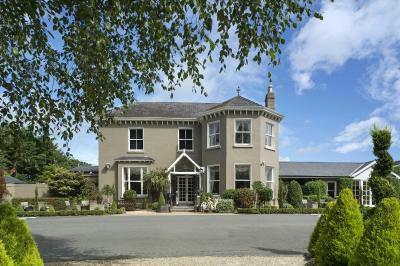 When would you like to stay at Summerhill House Hotel? Bright, spacious and airy, this room has a direct dial phone, a hairdryer and free toiletries. Tea and coffee-making facilities are provided with a selection of herbal teas. Bright, spacious and airy, this room has a direct dial phone, a hairdryer and free toiletries. Tea and coffee making facilities are provided with a selection of herbal teas. A family room will be a room with 2 double beds or one double 2 singles which is subject to availability. Situated within the Courtyard Townhouses, this double room is next to the hotel. Please note that this room cannot accommodate a crib or extra bed. This bright and spacious room features a telephone, a hairdryer, and tea and coffee-making facilities with a selection of herbal tea. The private bathroom has complimentary toiletries. Please request a double and a single bed or 3 single beds when booking. A beautiful country house with high ceiling elegant drawing room the Summerhill House Hotel is a warm and inviting as well as situated in a very picturesque location. 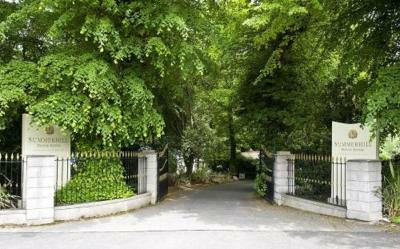 House Rules Summerhill House Hotel takes special requests – add in the next step! Summerhill House Hotel accepts these cards and reserves the right to temporarily hold an amount prior to arrival. The fact that we had only booked for a few days. We would have liked to stay longer. Will shall definitely return. The staff were excellent, polite, helpful and attentive. The breakfast was plentiful and a variety of choices. the local pub, cafes, coffee shop, restaurants and mini market were all in a short distance. The scenery was excellent. there is a bus route from Enniskerry village into Dublin. The Powerscourt Estate was a lovely experience. The function room for the wedding was lovely. Food wasn't bad. Rooms are not in the hotel, in a court yard beside the hotel. Basic and more like apartments. Very noisy with doors banging etc.the hotel part is nice with good breakfast. We understood that’s where we would be staying. If booking, make sure it’s not in the court yard. Address as in Main street Enniskerry confusing as it is quite a way from what would be considered main, hence web site should give Irish Grid reference for benefit of SatNav users. When the Irish Post code gets more established it will help. So far few seem to know about it. Also a very useful map available at reception did not have a scale on it --a very fundamental requirement for a map! Breakfast excellent. All quite satisfactory. This hotel is not up to standard at all. On arrival we were given a room outside of the hotel in what could only be described as a dump. The place was cold and damp. There were stains everywhere on the seating and in general very dated and abused. We asked for a room in the hotel and were given a room that was only slightly better but still in a shocking state of disrepair. Plaster cracking off walls, tiles in bathroom cracked sink cracked and the shower was so old I have never seen the type. Summer hill hotel's only asset are its staff who were very nice except the morning receptionist who did not even speak to us. The hotel is not up to standard at all and for the price charged one would expect much more.I would not recommend it at all. The only thing positive were the two staff we encountered the lovely receptionist on arrival and the lady at breakfast and the breakfast. Room was not ready on time...we checked in at 4.30pm and it was still not ready!!! Also it was tiny and cold all for €139...not value for money at all!!! Food was gorgeous and most of the staff were very friendly. It was fine...beautiful country house, great staff. Location excellent. Good. No disruption from anyone...managed a wedding and regular staying guests very well - which is exemplary.